The DIY custom-blended nail colour seen at Sibling is a piece-of-cake to recreate at home. Day Two of London Fashion Week kicked off with the incredible SIBLING S/S 16 show. Based in the new British Fashion Council venue – an NCP car park on Brewer Street – VIPs and street style icons brushed shoulders in the sunshine waiting for the show to begin. SIBLING are typically fearless and bold with both fashion and beauty and this seasons S/S 16 collection was no exception. Inspired by the colours and design of Sobranie cigarettes the colour scheme for this seasons nails were pink, lilac and black. The nails were created using ORLY’s EPIX Flexible Colour range (a gel-polish hybrid) that cures in natural light so it is ultra long-wearing and easy to apply (bonus point for no hassle polish removal!). Models wore one of the 3 colour options depending on their outfit; black, pink or lilac with a band of gold swept over the top of the nail creating a guilded french tip. This gold band was also inspired by the design of the classic Sobranie cigarettes. 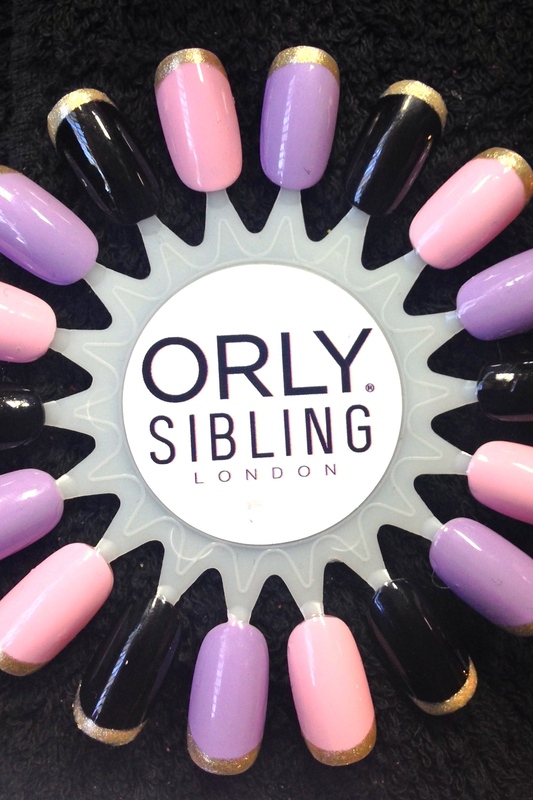 If you want to create the nail look as seen on the SIBLING S/S 16 catwalk the colours used were ORLY Cinematic (the purple shade), ORLY Outtake (the pink shade) and ORLY Blacklist. 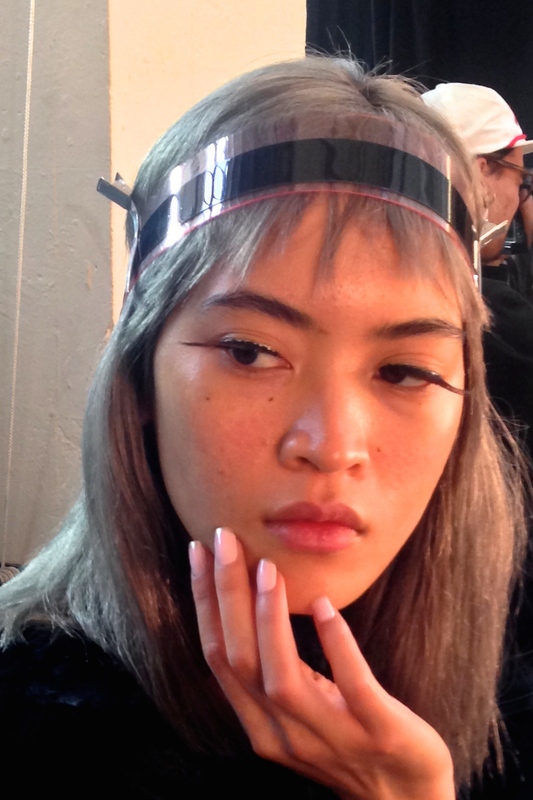 There were 23 models in the show, 10 wore black nails, eight lilac and five pink. The Cinematic and Outtake shades were then mixed with a third shade to create two unique blended colours. To match the Sibling pink shade blend ORLY Outtake with ORLY Close Up for a lighter, softer pink and to create the lilac shade blend ORLY Cinematic with ORLY Close Up. The gilded French tip used on all the nail colours was shade ORLY Tinsel Town. We love this trend. Not only does this mean we won’t match our friends (unless we want to of course), it also means our nail arsenal just got a whole lot bigger. Creating your own custom nail colour blend is much easier than you might think, and a rare catwalk trend that you can easily have fun with at home too. 2. Drop a small amount of each your chosen polishes into an old upturned bottle cap. 3.Recycle a nail polish brush from an old bottle you have finished. Clean the old brush with acetone remover to get rid of any left over or dried up polish and leave to dry. 4.Using your (newly clean and dry) recycled nail polish brush mix together your chosen shades in the bottle cap et voila! 5.Apply polish as normal and finish with a clear top coat for added longevity. An easy-peasy way to expand your nail polish colour options at home.